These guys can be enjoyed as is, or you can use them as a component in a swanky dish. Either way, fried green tomatoes are Okay in my book. Yesterday, The Beloved and I had a Very Fun Time wandering through eastern NC. We saw many Cool Things, and we ate some cool food. I will tell you all about it tomorrow, but today, I am sharing a treat that we enjoyed that will serve as a Sunday Supper. The treat is fried green tomatoes. If you’ve never had them and are Dubious, worry not. A green tomato isn’t a Vulcan tomato, it’s just a tomato that isn’t ripe, yet. They are firm and tart and can Greatly Benefit from a few minutes of pan frying to keep them from being too crunchy to enjoy. I have recently been on a FGT Kick, and I’ve had them prepared several different ways: with a tempura-like batter, with a thick, floury-peppery coating and with a hearty cornmeal crust. So far, I’m a fan of the cornmeal crust. Very southern, and to my mind, the crunch of the cornbread plays against the tart fim-oodgy texture of the tomatoes much better than crisp does. Whisk together the buttermilk and some hot sauce to taste. Add a healthy pinch of salt and tons of black pepper to the cornmeal. Whisk all that together. Soak the tomato slices for fifteen or twenty minutes in the buttermilk mixture. Take the tomatoes out of the buttermilk and sort of shake off the excess. Dredge the tomato slices in the cornmeal mix. Press down a bit to get a pretty thick coating on the slices. Over medium-ish heat, fry in oil or bacon drippings until golden brown on one side. Carefully flip and fry the other side. Drain on paper towels, and serve hot. Make a swanky sammich on sturdy bread. Goat cheese or Boursin is excellent with fried green tomatoes. Stack them with some melted cheese between them. Try using some mozarella and garnish with a basil aoili or pesto mayonnaise (stir pesto into mayo. Done) for a southern take on a Caprese Salad. Put a slice on a burger. Use lots of mayo on the bun. Mayonnaise and fried green tomatoes are Friends. Make a BLFGT sammich: bacon, lettuce, and fried green tomato. Oh, mama! Top with salsa verde or even guacamole. Hit it with a little chipotle in adobo, and you’re in business. Use fried green tomatoes instead of an English muffin as a base for an Eggs Benedict-inspired dish. I’m thinking that country ham and a nice poached egg would be right on time. Dress with some sausage gravy, and you’ll have a truly Southern take on a brunch classic. I’m sure you’ll come up with you own keen ideas. If you run with this and make something Awesome with fried green tomatoes, let me know. If you just make some and eat them, I’d like to know that, too. Enjoy! 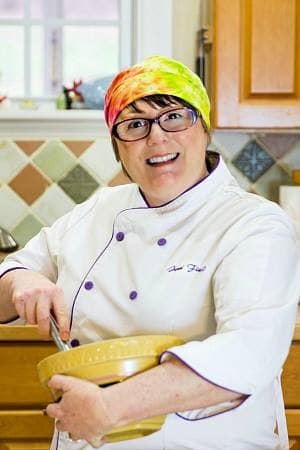 *Don’t fear bacon grease. Bacon and tomatoes are friends. You owe it to yourself to fry a green tomato in bacon grease at least once. 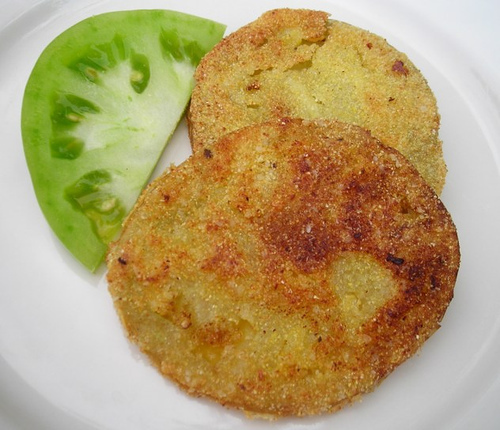 I absolutely love fried green tomatoes. Thank you so much for sharing your recipe.